Delaware On-line -- A bicyclist was hit by a car Friday evening in Newark and critically injured, authorities said. The incident was reported just before 6 p.m. in the 600 block of S. College Ave.
New Castle County Paramedics found the bicyclist – identified only as a 23-year-old man – with possible head and back injuries, Paramedic Cpl. Abigail E. Haas said. Poster's note: In this area of Newark, the sidewalk is the only refuge against the onslaught of cars and trucks. There is no place to ride except in the lane of traffic, ruling it out for all but the most skillful and brazen among us. To make matters worse, the Newark Bicycle Plan fails to include this area for future safety improvements. Another example is the Library Ave (Route 72) corridor between Route 273 and Wyoming Road. The crash area is circled in red above. 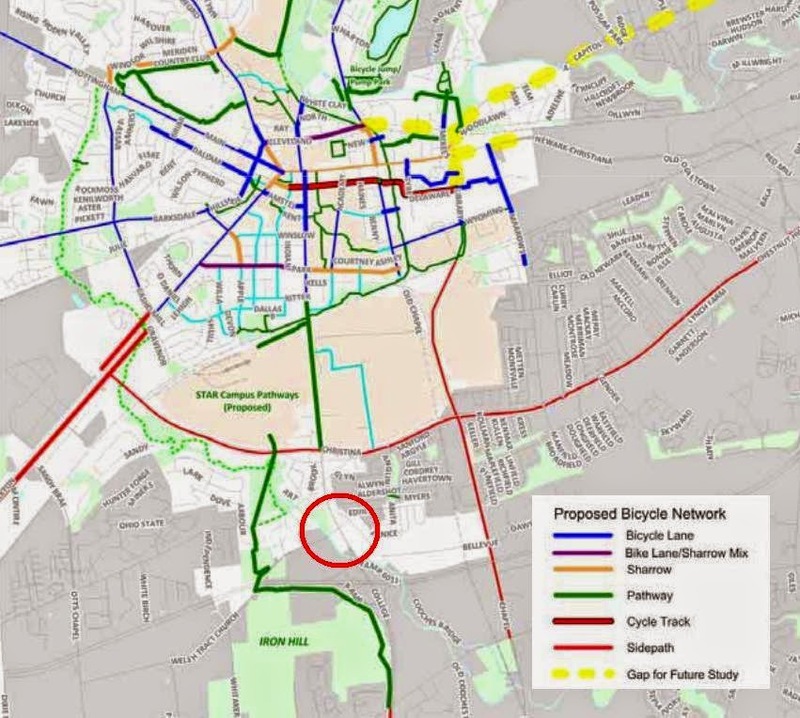 Note the proposed pathway to the west, however, this adds hills and does not service destinations along the Route 896/College Ave corridor. Hence, the need for a balanced approach to bicycle advocacy; one that includes on-road facilities in addition to Trails and Pathways.